We all need our morning cup of hot coffee to kick-start the day, and Tidewater Coffee will help you with all of your Office Coffee Delivery Services, while saving you time and money. Your office employees will enjoy freshly roasted coffee delivered to your office — that will meet your satisfaction each and every time. Our coffee services includes most brands of tea, single-serve brewers, and any type of break-room supplies you may require. We have researched and work with local regional and national roasters and choose quality equipment manufacturers with the best practices and prices allowing you to rest, refuel, and take a deserved coffee break yourself! Office Coffee Delivery Service has never been easier and in just a few moments you’ll have the opportunity to get an economical pricing quote with choices from over 140 coffees and flavors from local, regional and national roasters. The secret to our growth lies in our people, not only within our company but also the roasters and manufacturers that we partner with. 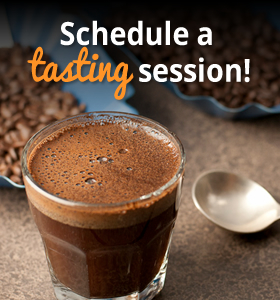 Why spend all day calling for prices when scheduling a tasting with Tidewater Coffee gets you the best service offer from the fastest growing, locally owned office coffee delivery service company in Hampton Roads. Already have coffee service and looking for a more reliable supplier or better pricing? We can analyze your present service and offer solutions to reduce costs and improve the quality of your current office coffee needs. Keeping your work-place stocked with coffee will keep your employees awake, focused and refreshed with the great taste of savory coffee that is sure to promote good friendly conversation. Tidewater Coffee is a trusted company that cares about your business and we’re here for all of your Office Coffee Service needs. Contact us or schedule a tasting to let your employees and customers know they are appreciated everyday by saying YES! to Tidewater Coffee’s Office Delivery Service.